Alak Zenkar Rinpoche Tupten Nyima (Tib. ཨ་ལགས་གཟན་དཀར་རིན་པོ་ཆེ་ཐུབ་བསྟན་ཉི་མ་, Wyl. a lags gzan dkar rin po che thub bstan nyi ma) aka Tudeng Nima (b. 1943) — the incarnation of Alak Zenkar Pema Ngödrup Rolwé Dorje. He has been instrumental in the resurgence of Buddhism and Tibetan literature in Kham in recent decades. 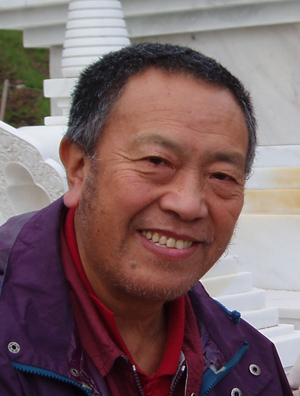 Alak Zenkar Rinpoche was born in Lhagang in Minyak, East Tibet, in 1943. His father was called Nyima Özer, and his mother, who was from Gyarong, was called Rinchen Lhamo. In 1946 he was recognized as the incarnation of Alak Zenkar Pema Ngödrup Rolwé Dorje (1881-1943), who was in turn the direct incarnation of Do Khyentse Yeshe Dorje (1800-1866), the mind incarnation of Jikmé Lingpa (1730-1798). Following his recognition, he was invited to take his seat in two different monasteries, Maha Kyilung monastery in Gyarong, which had been established by Do Khyentse, and the Sakya monastery of Lhagang in Minyak, which was home to the famous Lhagang Jowo statue. 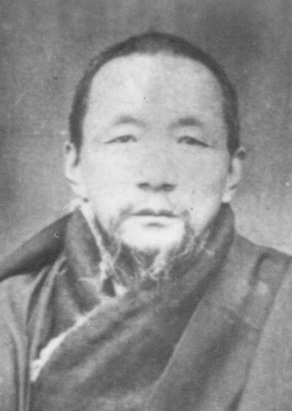 Rikhü Kushok (1892-1956), the chief Sakyapa lama in Minyak, was called upon to decide which of the two monasteries should take charge of the young tulku’s education, and he decided that Zenkar Rinpoche should divide his time between them both, spending a year at one, followed by a year at the other and so on. Zenkar Rinpoche was one of two tulkus at Lhagang. The other was a child of Chinese parents. They were the first generation of tulkus. Previously the seniormost monks had been those who had gone to Ngor to study and had become acharyas. Lhagang had a connection with the previous Zenkar Rinpoche and also with Do Khyentse’s sister, the great dakini, Losal Dolma (1802-1861). At the age of eight, Rinpoche studied the Bodhicharyavatara with his teacher Tulku Apar, from Maha Kyilung Monastery, who was a student of Dodrupchen’s root teacher, Yukhok Chatralwa. And he also had lots of oral traditions for commenting on the Kunzang Lamé Shyalung. The other main teacher at Maha Kyilung at the time was Akhu Gendün Gyatso, who had studied for five years at Dzogchen Shri Singha. He received novice ordination from Dzogchen Khenpo Thubten Nyendrak, also known as Khenpo Thubnyen, and was given the name Thubten Lungrik Mawé Nyima. From Khenpo Thubten Nyendrak he also received teachings on the Guhyagarbha Tantra, including The Ornament of the Wisdom Mind of the Lord of Secrets (gsang bdag dgongs rgyan) by Lochen Dharmashri and the overview commentary known as Key to the Precious Treasury written by Dodrupchen Jikmé Tenpé Nyima. His two principal teachers were the Sixth Dzogchen Rinpoche Jikdral Changchub Dorje (1935-1958/9) and his tutor, Khenpo Yönten Gönpo (1899-1959), who was known as Khenpo Gönri. From the Sixth Dzogchen Rinpoche, he received the transmissions of Nyingma Kama, the collection of termas known as The Excellent Wish-Fulfilling Vase (‘dod ‘jo bum bzang) and the root texts of the Longchen Nyingtik. From Khenpo Gönrig he received the Seven Treasures of Longchenpa, Yeshe Lama, Barak Namsum, Vajrakilaya according to the Phurba Gyüluk, Chetsün Nyingtik and Do Khyentse Yeshe Dorje’s cycle of chöd teachings, Self Liberation of Grasping (Dzinpa Rangdrol) many times. He received teachings on the three sets of vows (sdom gsum) from Dzogchen Khenpo Pema Tsewang . He received teachings on poetry as well as on Shabkar’s Dzogchen instruction manual (khrid yig) from Khenpo Ngawang Norbu. And he received a commentary on the Aspiration Prayer of Sukhavati (bde smon) from Alak Lakla Chödrup. It was in Dzogchen that Zenkar Rinpoche first met the Fourth Dodrupchen Rinpoche. Maha Kyilung was in some sense a branch of Dodrup monastery. When they first met, Dodrupchen Rinpoche was about to give the empowerments for the Treasury of Precious Termas (rin chen gter mdzod), so Zenkar Rinpoche went to Dodrup Monastery to receive it. Shortly before this time, Dodrupchen monastery had based its study programme largely on Gelugpa teachings, especially the yigcha texts of Jamyang Shyepa. However, Khenpo Kunpal had recently told Dodrupchen Rinpoche to establish a new shedra where Nyingma teachings would be given. This meant that they had to bring in new khenpos from outside. But while Zenkar Rinpoche was there he studied with the older teachers who had been trained in the Gelugpa School. He studied all the basic Gelugpa treatises, including the presentations of the paths and bhumis, the seventy points of the Abhisamayalankara, The Precious Garland of Philosophical Tenets (grub mtha’ rin chen phreng ba) by Könchok Jikme Wangpo and so on. In 1955, he went to Dzongsar. He received some Sakya teachings from Gongna Rinpoche and stayed there for about six months. Jamyang Khyentse Rinpoche left two months after he arrived, on the beginning of his pilgrimage to Central Tibet that would eventually take him into exile. Zenkar Rinpoche remembers that Jamyang Khyentse was very friendly with the young lamas and tulkus, but still they were often afraid of him because he had a habit of testing their knowledge. He would ask what they were studying and then get them to recite some verses. On one occasion, Zenkar Rinpoche received the reading transmission of The Sutra of the Embodiment of Enlightened Intentions (mdo dgongs pa ‘dus pa). He had a copy of the text so that he could follow it as Jamyang Khyentse read aloud, but even though Jamyang Khyentse sounded as if he was reading at quite a slow pace, Zenkar Rinpoche could not keep up. While he was there, he also received from Jamyang Khyentse the transmission for some parts of the previous Jamyang Khyentse’s collected works. He also studied handwriting with Jamyang Khyentse Chökyi Lodrö’s famous calligrapher, Drungyik Tsering. From Dzongsar Khenpo Damchö, who was from Minyak, he received teachings on Sakya Pandita’s Treasury of Valid Reasoning (tshad ma rigs gter) and Jamyang Loter Wangpo’s commentary on the Treasury of Abhidharma. After his stay in Dzongsar, Zenkar Rinpoche returned to Dodrupchen Monastery. The following year, Dodrupchen Rinpoche fled to Central Tibet. Having learned Chinese, he was appointed to work on the Great Tibetan-Chinese Dictionary (bod rgya tshig mdzod chen mo) from 1978 to 1985, serving as the deputy editor-in-chief. 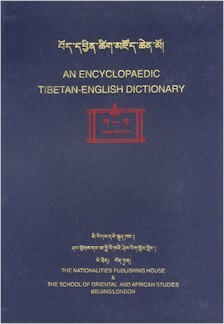 From July 1992 to April 1999, he worked on the English translation of The Great Dictionary, with Dr. Gyurme Dorje at the School of Oriental and African Studies in London. In 1996, he met E. Gene Smith in London, and they instantly became great friends on account of their deep appreciation for, and unparalleled knowledge of, Tibetan literature. From 1999, he spent periods in New York. He was a senior research scholar at Columbia University in the East Asian Institute, and also worked periodically with the Nitartha Organization in Vancouver on a project to compile a dictionary of terminology for the eight chariots of the practice lineage. He is the Director and Founder of the Project for Searching and Making Available Rare Texts in Chengdu China. In addition, he compiled a dictionary of terms from the Gesar epic in Tibetan and Chinese. He was the co-founder, vice-principal and Professor of Tibetology at the Sichuan Tibetan Language School in Chengdu, Sichuan, where he established a school for advanced studies in Tibetan language and culture. Additionally, from 1988 to the present, Rinpoche has served as a Representative in the National People’s Congress in the People’s Republic of China, a Representative in the Sichuan Provincial People’s Congress, Vice Secretary in the Sichuan Buddhist Association and is a Standing Member of the China Buddhist Association. He inspired the creation of Dipamkara, in order to translate A Guide to the Words of My Perfect Teacher, written by the great Khenpo Ngakchung. ↑ See David P. Jackson, A Saint in Seattle, Wisdom Publications, 2005, pp. 126-7 and 200-3 for more information. There are also photographs of him on pages 127 and 202. ↑ Zenkar means literally ‘white shawl’. This page was last edited on 2 August 2017, at 03:20.